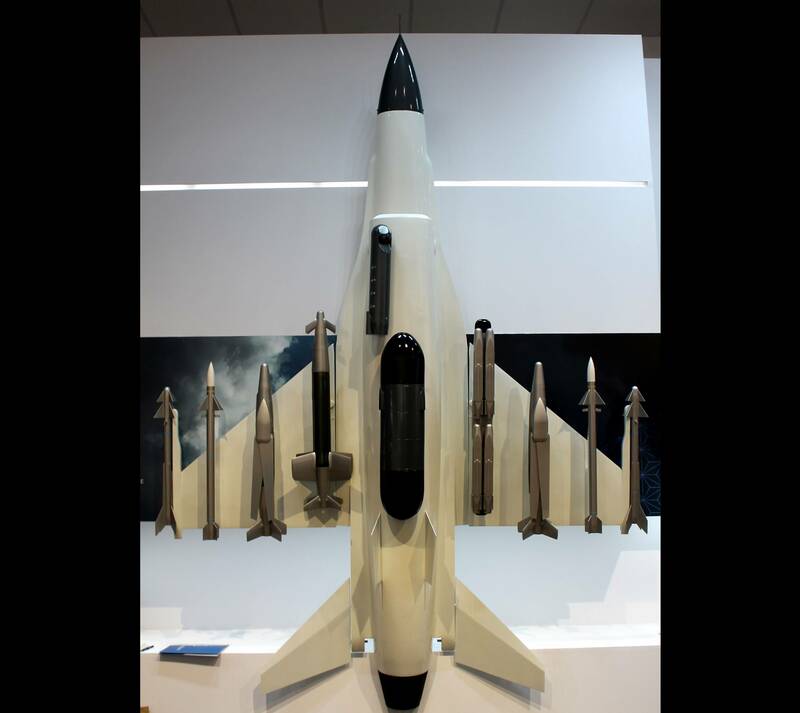 Rafael’s line-up of air-delivered weapons is fully represented in this mock-up of an F-16’s underside at the company’s 2017 Paris Air Show exhibit booth. Prominently situated within Rafael’s building in the static display (A8) is this wall-mounted model of an F-16. It is carrying an entire suite of air-launched weaponry, all available from the Israeli company. Of particular interest, the Spice 250 is newly-developed and can be equipped with alternative precision guidance systems and warheads. It has a standoff range of 100 km. Like the Spice 1000, it can be guided by scene-matching, a technology that is usually found only on long-range cruise missiles. The Smart Quad Rack from which it hangs has its own datalink, allowing for target updates to be transmitted to the bomb after takeoff. That large Sky Shield EW pod has not been shown previously. It provides high power over a wide frequency range in a 360-degree radius. The digital receiver can track complex emitters with high direction-finding accuracy. The multi-beam array transmitters are based on solid-state amplifiers. Sky Shield can protect an entire fighter formation, not just a single aircraft. It has already found an interested international customer. As usual with Israeli exhibitors, Rafael is reluctant to disclose customers. But an adjacent information display discloses that these airborne weapons can be found on a wide range of platforms, namely the F-15, F-16, F-18, Super Tucano, L-39, Su-30, LCA (India), FA-80, Eurofighter Typhoon, Mirage 2000 and Rafale.